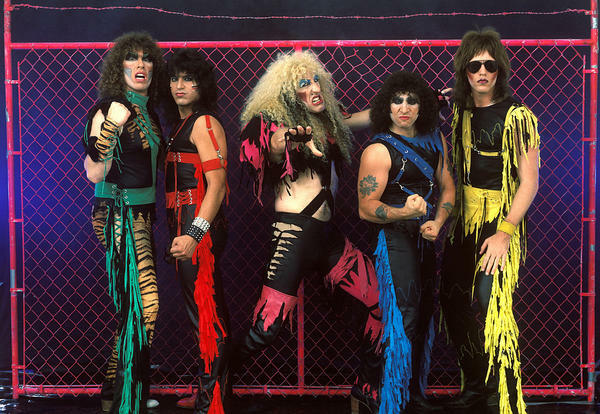 Dee Snider (center) with the rest of Twisted Sister in 1984. Dee Snider appears on Capitol Hill at the Parents Music Resource Center senate hearing in 1985. Back in April, teachers in Oklahoma went on strike, demanding increases to salaries and school funding. Their message was amplified by a song — one that, 34 years earlier, had been the sound of student rebellion. "We're Not Gonna Take It," by the hair metal act Twisted Sister, was once named among the "Filthy 15" songs singled out for offensive content and brought before Congress by concerned parents in the 1980s. It's also an indelible hit, whose instantly recognizable hook practically invites the listener to shout along. According to frontman Dee Snider, that was very much the point. "I wanted to write an anthem," the now 63-year-old Snider says. "I'm from the Alice Cooper school of 'School's Out,' 'I'm Eighteen,' you know? And Alice was very big on these anthemic songs. So I wanted to write an anthem for the audience to raise their fists in the air in righteous anger." Snider says the chorus came to him quickly, but it took more than three years to complete the song to his satisfaction, before it was released in 1984. Rock fans loved it; critics, not so much. Snider says he remembers one review of "We're Not Gonna Take It" that simply read, "What? From whom?" "That was the review — what, from whom," Snider says. "Aren't we so ironic and funny and wonderful. But who has had the last laugh? I mean, 35, 40, whatever it was years later, it's a folk song, for God's sake. And it made millions of dollars, so ha, ha, ha." Over time, though, the criticisms got more serious — and the critics had more power. Some readers of this story may be old enough to remember a group called the Parents Music Resource Center, established in 1985; Al Gore's then-wife Tipper was one of its leaders. The group argued for parental control of music that could expose children to adult themes or potentially offensive language, and it singled out "We're Not Gonna Take It" for scrutiny. Washington paid attention. 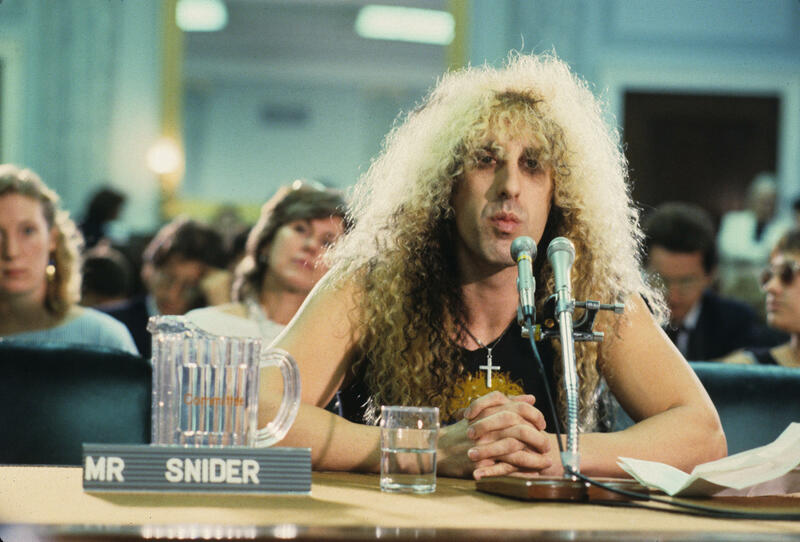 On September 19, 1985, Dee Snider was called to testify before the U.S. Senate. You'd think even a rock star might wear a suit for the occasion, or at least a button down shirt. Not Snider: He showed up with a black cutoff t-shirt, ripped-up jeans and his signature explosion of long, curly blond hair. "I knew I was going to blindside 'em," Snider says. "There was an old TV show called Columbo with Peter Falk, and it was this bumbling detective who seemed like such a screw-up but he was actually brilliant. And I said, 'They're gonna look at me, and I'm gonna play right into this. I'm gonna have my speech that we worked on for two weeks stuffed in the back pocket of my skinny jeans.' And I pulled it out like the bad kid in class. You know, 'You got your homework, Dee?' 'Yeah.' And then I just laid them out." Snider said in testimony that day: "The beauty of literature, poetry and music is that they leave room for the audience to put its own imagination, experiences and dreams into the words. The examples I cited earlier showed clear evidence of Twisted Sister's music being completely misinterpreted and unfairly judged by supposedly well-informed adults. We cannot allow this to continue." In the end, Congress didn't have to act on the matter, because the major recording labels voluntarily agreed to put generic "Parental Advisory" stickers on some albums. But in the process, "We're Not Gonna Take It" had become an anthem about fighting censorship. It wasn't long before the song started to be used as an anthem elsewhere in public life. The New York Yankees adopted it, as did soccer fans in Germany. A Christian rock band, Apologetix, reinterpreted it as "We're Not Going to Canaan." And in a great ironic twist, just a few decades after the song was pilloried on Capitol Hill, politicians started using it at campaign events. Snider says he was okay with Arnold Schwarzenegger using it: "My Stay Hungry album was literally inspired by reading one of Arnold's books. I was a huge fan from back in his bodybuilding days, and 'stay hungry' was one of his catch phrases." He was less thrilled when Paul Ryan started playing it on the campaign trail. "I am pro-choice to a fault, and Paul Ryan stands so far on the other side of that fence," he explains. "I called him up and said, 'The first line of the song is, 'We've got the right to choose.' Don't you even vet these things?' "
But it was a far more complicated decision when it came to Donald Trump's use of the song. Snider had been a contestant on Trump's reality show, The Celebrity Apprentice. The two brash New Yorkers had struck up a friendship. "I spent time with the Trump family. They were great; we did charity events together," he says. "And Donald asked if he could use the song. And I said sure — he's a friend. I thought we were on the same page. Three months later, I'm tapping out: He is now talking about things [in his politics] we never spoke about at dinner. "To his credit, I called and I said, 'You've gotta stop using the song. I can't have people think I am endorsing you by using the song.' He said OK — and that night, he never used it again. That was the end. And I said, 'Are we cool?' And he said, 'Dee, we've done so much charity work together — of course we're cool.' "
Which brings us back to the striking teachers in Oklahoma. Joel Deardorf ran the band program at Norman High School in Norman, Okla., and recommended the song to the makeshift marching band that had assembled at the state capitol. "That was a piece that we played at some football games. My thought was: this would be a fantastic, like — call it a fight song," he says. "Music speaks differently to different people, and while some people might be impassioned by a speaker, other people might be impassioned by music. So I think it gave the walkout another avenue to communicate why we were doing this." Dee Snider approved. "The first thing that struck me is how ironic it was that the teachers were singing 'We're Not Gonna Take It,' " he says, "because back in the '80s, I remember teachers walking up to me on the street and going, 'Thanks a lot!' Teachers were not really fans back then. But many of those young people who were in those classrooms, you cut to 30 years later and they're teachers now. And this is their battle cry." Twisted Sister broke up at the end of 1987. Dee Snider continued to write anthems, though it was hard to replicate the magic of "We're Not Gonna Take It." "It has transcended the genre, it's transcended the era, it's even transcended the band. And this song will live on long after I am gone," Snider says. "I think, as a songwriter, there's no greater compliment than to have something you created become part of the fabric of not just the country — of society, of the world. And if it's a voice for the oppressed in any fashion, my job is done." Back in April, teachers in Oklahoma went on strike. And their message was amplified by a song. UNIDENTIFIED CROWD: (Singing) We're not going to take it. No, we ain't going to take it. MARTIN: Protesting educators found their voice in Twisted Sister's heavy metal hit "We're Not Gonna Take It." That song has been appropriated in wildly different ways over the years, which makes it perfect for NPR's series American Anthem all about songs that have inspired, rallied, even revolutionized. MARTIN: In 1984, this was the sound of student rebellion. TWISTED SISTER: (Singing) We're not going to take it. No, we ain't going to take it. We're not going to take it anymore. DEE SNIDER: I wanted to write an anthem for the audience to raise their fists in the air in righteous anger. MARTIN: That is the distinctive voice of Twisted Sister's frontman, Dee Snider. He told me the chorus came to him quickly, but it took more than three years to really get the song where he wanted it to be. Rock fans loved it. Critics - not so much. Snider remembers getting one brief but scathing review about the name "We're Not Gonna Take It." SNIDER: That was the review - what from whom? Aren't we so ironic and funny and wonderful? But who has had the last laugh? I mean, 35, 40, whatever years later, it's a folk song, for God's sakes. And it's made millions of dollars, so ha ha ha. TWISTED SISTER: (Singing) Oh, you're so condescending. Your gall is never-ending. We don't want nothing, nothing from you. MARTIN: Time passed, and the criticisms got more serious. And the critics had more power. The Parents Music Resource Center, or PMRC, was this group established in 1985. Al Gore's then wife Tipper was one of the leaders. And their big issue was they didn't like that kids could be exposed to adult themes or potentially offensive language in music. And they singled out "We're Not Gonna Take It." Washington, D.C., paid attention. MARTIN: On September 19, 1985, Dee Snider was called to testify before the U.S. Senate. UNIDENTIFIED PERSON: Mr. Snider, thank you for being here. MARTIN: You'd think maybe even a rock star might wear a suit or at least a button-down shirt. Not Snider. He showed up with a black cutoff T-shirt, ripped up jeans and that explosion of long, blond, curly hair. SNIDER: I knew I was going to blindside them. There's an old TV show called "Columbo." And it was this bumbling detective who seemed like such a screw-up, but he was actually brilliant. And I said, they're going to look at me, and I'm going to play right into this. I'm going to have my speech that we worked on for two weeks stuffed in the back pocket of my skinny jeans. And I pulled it out like the bad kid in class. You know, you got your homework, Dee? Yeah. MARTIN: Right. It looks like a dirty Kleenex that you're putting down (laughter). SNIDER: Oh, yeah, yeah, yeah, yeah. And then I just laid them out. SNIDER: The beauty of literature, poetry and music is that they leave room for the audience to put its own imagination, experiences and dreams into the words. The examples I cited earlier showed clear evidence of Twisted Sister's music being completely misinterpreted and unfairly judged by supposedly well-informed adults. We cannot allow this to continue. MARTIN: And "We're Not Gonna Take It" was now an anthem about fighting censorship. SNIDER: It just started transforming. MARTIN: The beauty of the song is that anyone could project their own story onto it. SNIDER: The Yankees started using it. It became - started becoming this rock and jock thing. MARTIN: German soccer fans gave the song new lyrics. BAYERN-FANS UNITED: (Singing in German). MARTIN: It was even embraced by a Christian rock band called ApologetiX. They reinterpreted the song as "We're Not Going To Canaaan." APOLOGETIX: (Singing) Despite the powers of Egypt, God picked us just to reach it. MARTIN: And in a great ironic twist, just a few decades after the song was pilloried on Capitol Hill, politicians started using the song at campaign events. Dee Snider was OK with Arnold Schwarzenegger using it, not at all happy with Paul Ryan doing so. But it was a far more complicated decision when it came to this guy. PRESIDENT DONALD TRUMP: And we will make America great again. Thank you. Thank you. Thank you. MARTIN: Snider had been a contestant on Donald Trump's reality show "Celebrity Apprentice." The two brash New Yorkers struck up a friendship. MARTIN: Like - what? - just his politics that you didn't know? SNIDER: His politics, yeah. And to his credit, I called and I said, I can't have people think I'm endorsing you by using the song. He said OK. And that night - he never used it again. That was the end. And I said, are we cool? And he said, Dee, we've done so much charity work together. Of course we're cool. MARTIN: And that brings us back to where we started - those striking teachers in Oklahoma. MARTIN: As a band director, how do you think it sounded? JOEL DEARDORF: Oh, we killed it. MARTIN: Joel Deardorf taught music at Norman High School in Oklahoma. He's the one who brought the song to the makeshift marching band there at the state capitol. DEARDORF: And that was a piece that we played at some football games. My thought was this would be a fantastic, like, so-called fight song. It's the fight song for the walkout. DEARDORF: I think it gave the walkout another avenue to communicate why we were doing this. SNIDER: If it's a voice for the oppressed in any fashion, my job is done. TWISTED SISTER: (Singing) Anymore, no way. MARTIN: Twisted Sister broke up at the end of 1987. Dee Snider continued to write anthems, but it was hard to replicate the magic of "We're Not Gonna Take It." SNIDER: It has transcended the genre. It's transcended the era. It's even transcended the band. And this song will live on long after I am gone. I think as a songwriter, there's no greater compliment. TWISTED SISTER: (Singing) Oh, oh, oh. MARTIN: This story and all of the stories from our American Anthem series can be found at nprmusic.org. Transcript provided by NPR, Copyright NPR.